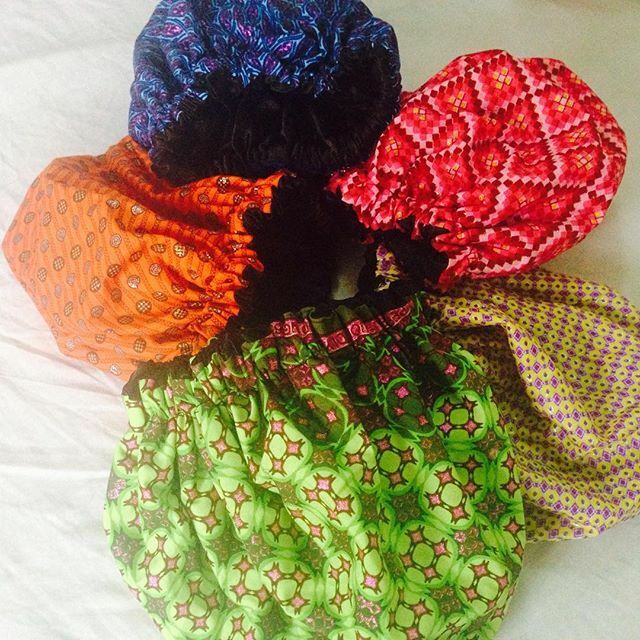 In addition to our favourite things, we also have these cute Ankara-Silk bonnets handmade by Elizabeth Cress, in-store. If you don’t like the look of plain black bonnets, and you want to go to sleep in style, you should definitely try these out. They are pretty solid and built to last. The insides are satin/silk, with the print on top. Official retail price for each bonnet is 2000. Nothing But Intense Healing Mask: Formerly 3500, Now 2500. Shea Moisture Frizz Free Curl Mousse: Formerly 3200, Now 2500. L’Oreal Ever Creme Sulfate Free Shampoo: Formerly 2300, Now 1800. Our accessories remain the same: for 1500 Naira, you can get a 12-pack of Scunci Hair Combs or an 8 pack of Goody Ouchless Hair Bands in Neutral Colours. Goody Ouchless bands are known for being very stretchy, long lasting bands, great for creating killer puffs. The Scunci hair combs are pretty durable too. I’ve been using one pack of each since the year began, and they will definitely see me into next year. Very small investments to make in your hair arsenal! To order, email: thekinkandi@gmail.com. Delivery rates and information about our process are also on the shop page here. Do you know we have a Where to Find Directory on the blog? When was the last time you visited? Our directory, thanks to the collective effort of you beautiful people is a very helpful steady growing resource for anybody looking to buy natural hair friendly products, or to visit natural hair friendly salons in Nigeria. Our latest addition to The Directory is Sheamapo! My name is Marilyn and I am not a product junkie. If anything, I lie on the other end of the spectrum. I’m not one for trying out new products except they’re free or I’m being forced to try them out. So when I stumbled on Naturalista Juicy Leave-In Conditioner it was both free and I was kind of being forced to try it out. I took what I believed was moisturised hair to Ijeoma of Klassy Kinks, to get Havana twists and so when she remarked that my hair was dry, I was quite surprised. In a bid to find a conditioner that would help lock in my moisture, she very kindly tried a couple of leave-ins she had, but my hair refused them all (so spoilt!). And then she opened up a new sample jar of Naturalista Juicy Leave-In Conditioner and the first thing that got me was the smell. This tiny jar of happiness smells completely like cake. I kid you not. If I hadn’t seen her unwrap it, it would have taken a lot to convince me that the jar didn’t contain cake batter. It’s creamy colour and mousse-like texture makes it even more like a dessert, than a hair product. But the aesthetics isn’t the only thing that this product is good for, no no no. In the hours I spent braiding my hair, this was the only product that managed to moisturise my hair! Imagine my joy when she offered to let me have the entire jar for keeps! This product made my hair so soft and in addition, the moisture really was maintained for almost an entire week! Can you believe that?! An entire week. Seven whole days! I think this product was made by angels… only explanation. 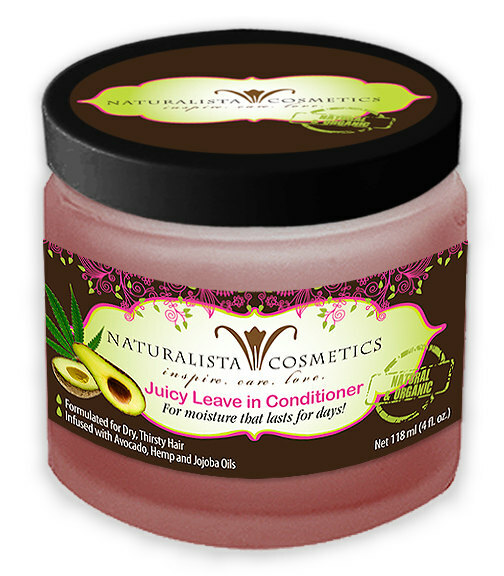 So what makes this Naturalista Juicy Leave-In Conditioner what it is? This juicy hair dessert contains an impressive list of ingredients, viz. Shea Butter, Aloe Leave Juice, Castor Oil, Jojoba Oil, Avocado Oil, Hemp Seed Oil, Coconut Oil, Olive Oil, Panthenol, Vegetable Gylcerin, Vitamin E, Honey, Lemon Peel Oil, Orange Peel Oil, Fragrance, Natural Preservatives. One thing that jumps at me when I look at the ingredients is how simple they are; and how most of them are lone ingredients that I have either mixed with water for daily spritzing or added to my DIY deep conditioning treatments. Is this product without sin then? For me, this product is flawless (it really did wake up like this). However, because of its mixture and its consistency, it might border on being too greasy for some people, out of personal preference, and even because of their hair type and porosity. Are you sold on this product and want to have a piece of the cake? Sadly, I am yet to replace this product in my life! It just seems very evasive, which has made my hair and I very sad. However, I was able to find it still available here . I was interested in buying the 8oz jar ($22.99), but it is currently sold out. The 16 oz jar ($45.99) is still available though. On the website above, the product is being sold under its new name of Juicy Yummy. The 2 oz jar ($7.99) is available for sale here . If you cannot tell by now, I’ll go ahead and say it. I LOVE this product and yes, it is probably the best thing that has touched my hair till date. Have you tried this product? What are your thoughts about it? Have a brilliant day people! For more about the benefits of this flaxseed for your health and hair, please go here, here, and here. 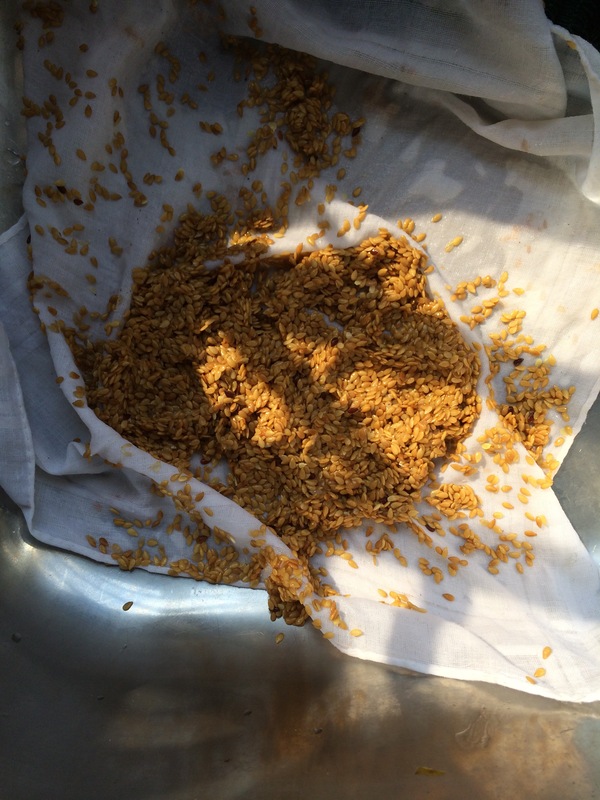 There are two types- brown and golden brown- but the brown seed is more nutritious. 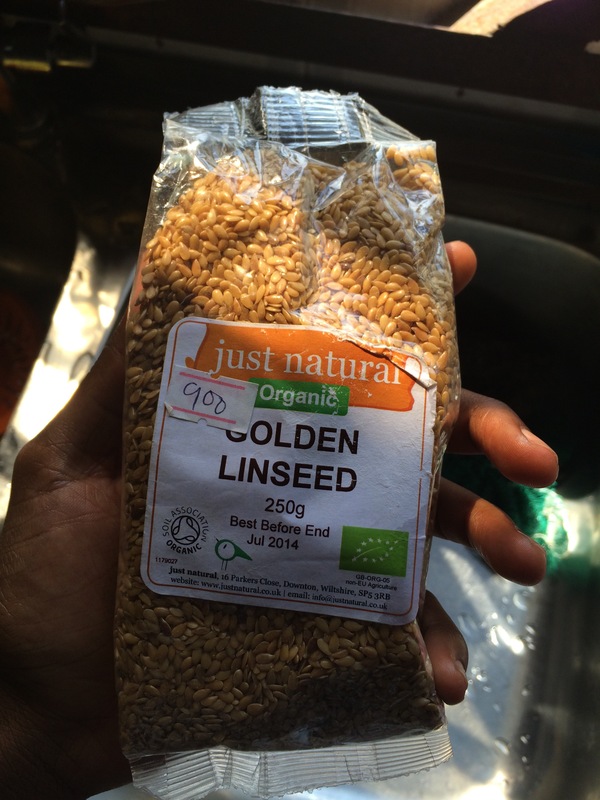 I got my golden brown linseed when I was in Lagos for Easter, from Fig Health Store. Contact deets are down, at the end of the post. This 250g pack cost me 900 naira. Fig Health Store is also on online retailer, Buyam. Did you know? Delivery on Buyam is free nationwide! Love Buyam! It’s really simple. 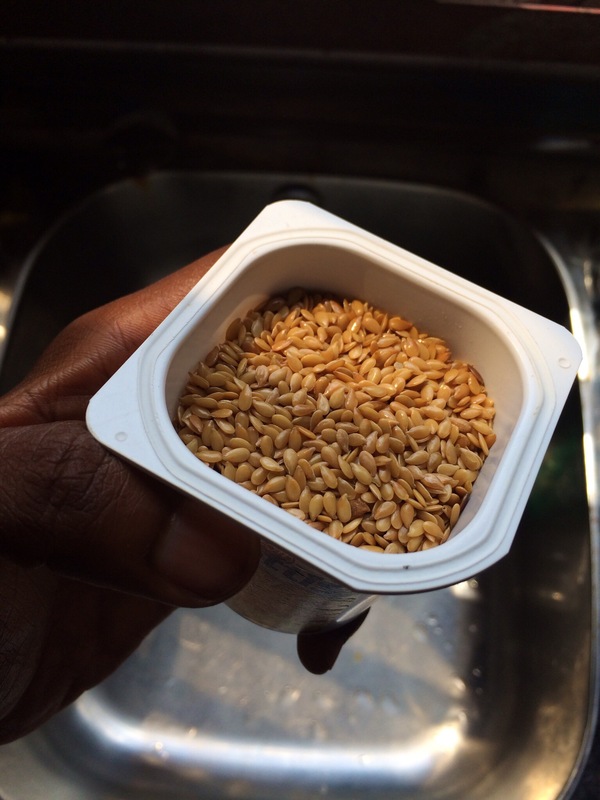 I used a yogurt cup to measure my flaxseed. Some instructions I saw online said ½ cup flaxseed to 2 cups water, so I tried that ratio but no, that wasn’t working out. So I used this cup of yogurt and 3 cups water at first, but when it got too thick, I added about 500ml of water. Just be intuitive about your mixing, go with the flow. 1. 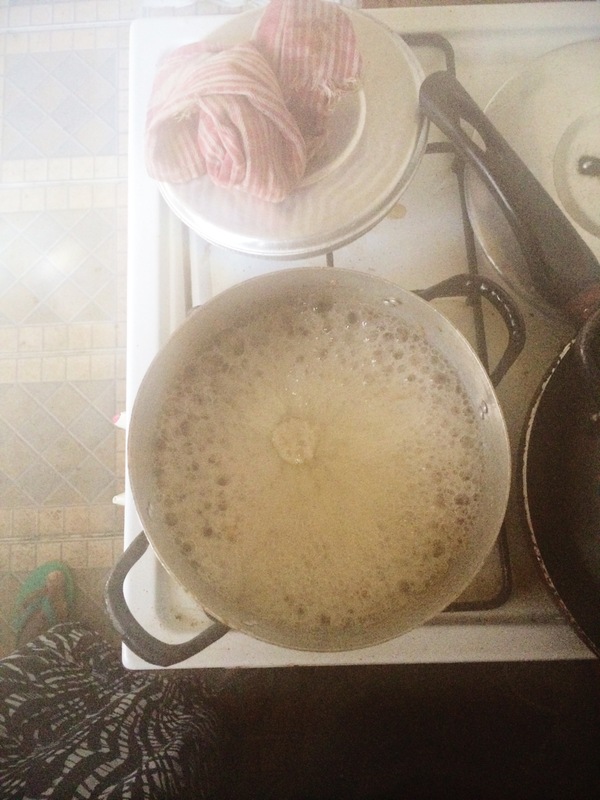 Put your flaxseed in a pot, add water and leave to boil. 2. Do not cover the pot! This is important. I covered the pot and came back to see my gel that wasn’t up to half the pot had boiled over. A lot of gel wasted on my stove top. 3. 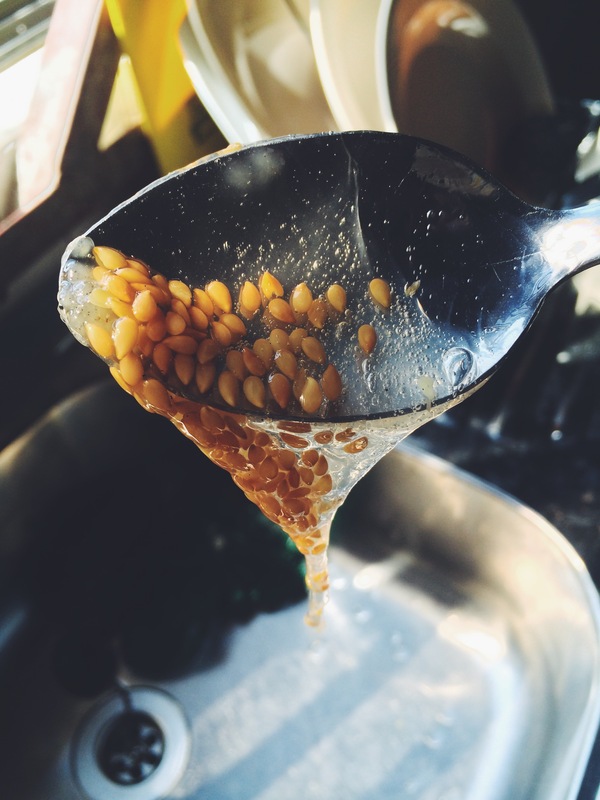 Stir from time to time to make sure that the flaxseed does not stick to the sides or the bottom of the pot. When this happened, my gel was the right consistency. Not too watery, but not too thick either. 5. 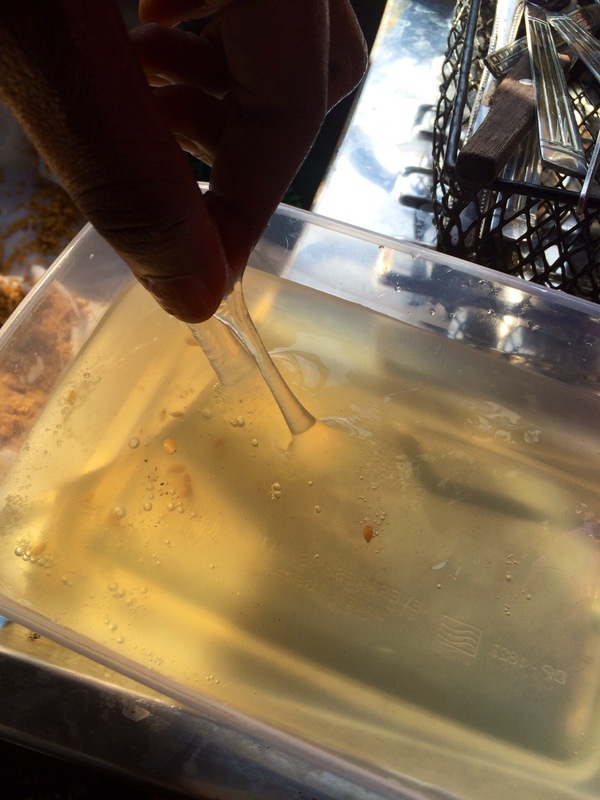 Okay, now your gel is the right consistency, time to strain. Pantyhose is ideal, and I think one of those 200 naira mesh sieves (the ones with the same flimsy net as you’d see on some wooden kitchen doors) should be perfect too. I didn’t have either, so I improvised with a handkerchief. 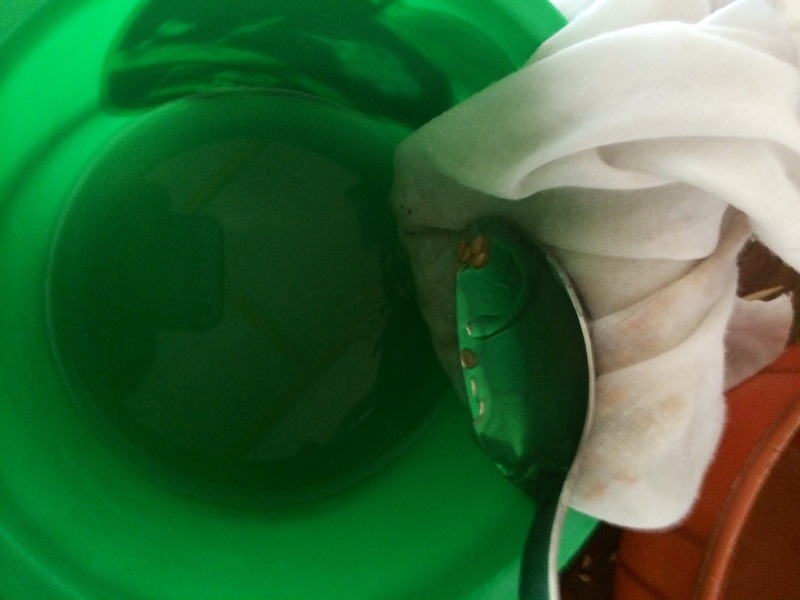 I placed it over a bowl and poured in the gel. 6. 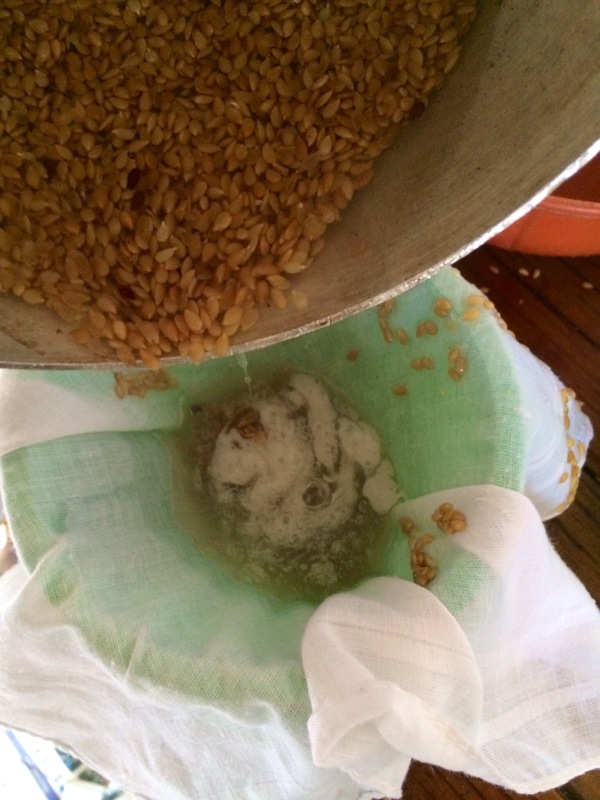 Store your gel, wash up and you could also store your seeds to use another time. 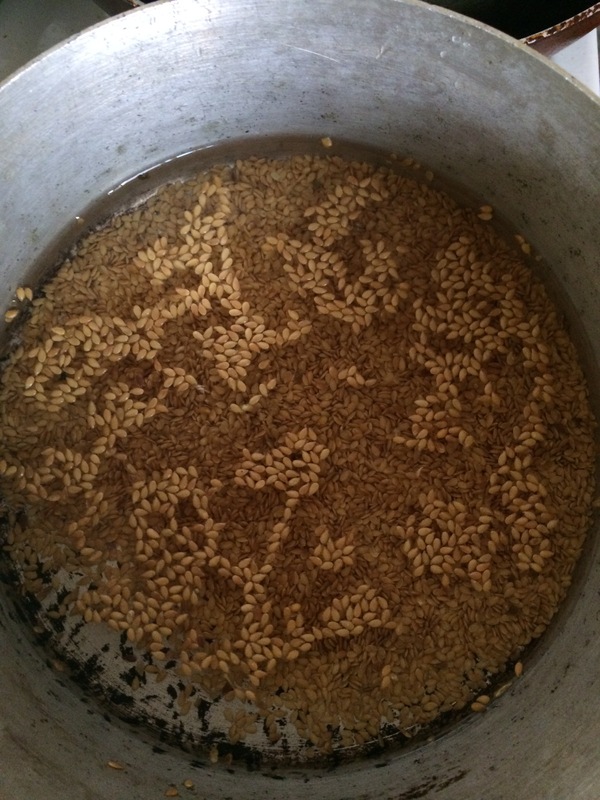 This was my first time making flaxseed and I think it was a success. You can add Vitamin E oil (it’s a natural preservative), to keep your gel in good condition. Refrigerate, and it should last you 2 weeks. So, don’t make too much, or when you do, pour your friends some. You can also add your favourite essential oils for their properties and fragrances. My gel made enough for like 3 uses. 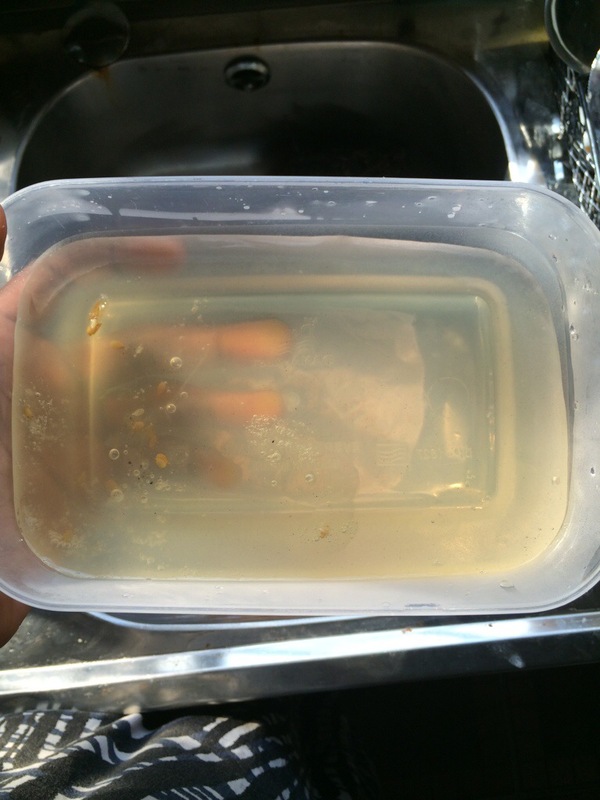 I didn’t have any containers though, so I’m sad to say I wasted what I did not use. I don’t plan to use gel anytime soon, so it didn’t make sense to try to store it. On the same day I made the gel, I used it to 3-strand twist on blow dried hair. I used SO much, I guess I just went ham because I read that flaxseed is moisturising. I unravelled the twists when dry, and I had very defined curls in fact too defined, but the flaking was crazy! Not scalp flaking oh, I mean flaking on my hair. So bad I had to wash. I’ll properly review flaxseed gel after a couple more uses. For now, I’d just say, go easy on your flaxseed when you use it. Use it as you would use normal store-bought gel. Opposite a blue house, Lekki Phase 1.